This outfit gained many likes on my Instagram profile so I decided to publish all photos also on my blog. What's the fuss about it? Well, firstly it's very simple and it's easy to combine. It's tailor and cut flatter the shilluete, and its mid size just feels right. It's sounds like good piece to invest in right? It's available to purchase in Waggon boutiques word wide. I've a got a lot of mails from you about my watch I don't ever take off my hand. It's a wood made automatic watch with a see trough mechanism. Sounds good right? 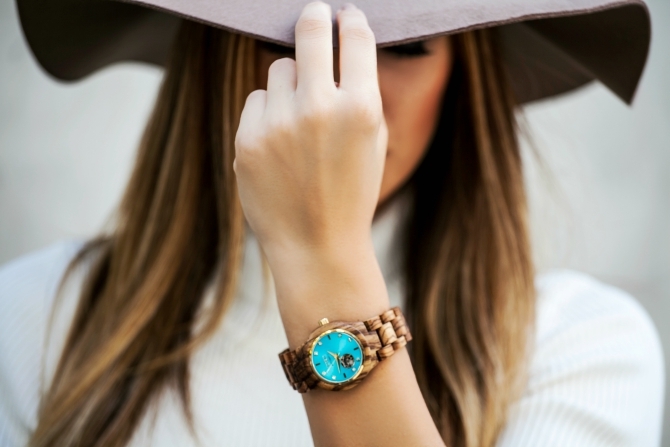 The thing I like most about my Jord watch is its turquoise color which is so eye catchy. Won't you agree? My Jord watch is available for purchase here. Ovaj outfit je zadobio mnogo lajkova na mom Instagramu i zato ga delim sa vama i na blogu. Čekaju vas i neobjavljene slike ovde. Evo da počnem, on je jako jednostavan i svako lako može da ga uklopi. U čemu je fora? U kroju, njegovoj dužini i boji. Kroj laska figuri, dužina je jako kulturna i prolazi svuda. Boja je jako zahvalna za kombinovanje i ono što verovatno i vi možete da zaključite je da je ona dobar komad u koji treba investirati. Možete je nabaviti u radnji Waggon u Nušićevoj 8. Dobila sam dosta mejlova vezano za sat koji nosim svaki dan. Radi se o drvenom časovniku sa providnim i automatskim mehanizmom. Trenutno je on moj izbor broj 1 a ono što mi se najviše dopada kod njega je tirkizni cifarnik. On se savršeno uklopio sa današnjom kombinacijom i Jord sat kao moj možete naručiti ovde. All pictures of Lily on www.amolusso.com are protected by copyright. Using Lily's pictures without visibly naming the source, claiming it is you in the pictures or pretending to be Lily or using them for an online advertisement all fall under copyright infringement and / or identity theft. These are serious legal matters. When pictures from this blog are used in incorrect ways, (legal) steps will be taken. Posting a picture on your blog is no problem, just make sure there is always a visible link back to this blog. Thank you.